Word has come out that 1.7 may include biome changes. Stay tuned. For instance, we can only find mountains in the Extreme Hills (EH) biome and the X-hills biomes (ForestHills, DesertHills, etc.) In the EH biome, height changes are forced, ALWAYS leaving us with a sloppy mess of turquoise spam reaching to the heavens. In the X-hills biomes, the same thing happens, except height changes hardly ever reach "mountain level." As you see from this picture, the only way to achieve max-height terrain is to visit the EH biome. No, X-hills will not allow you to do this. What we do know is that EH biomes and X-hills together give us a somewhat decent array of variation, but 1.7.3's array was a LOT bigger. Want proof? In this image, not only is there an overhang and a thin rocky formation, but there is flat land isolating both of these. There is no way to represent full random height variation in one picture, but this may give you a hint as to what it may be. What else can we bring to the plate? Beta 1.8+ babies may not know what this is. 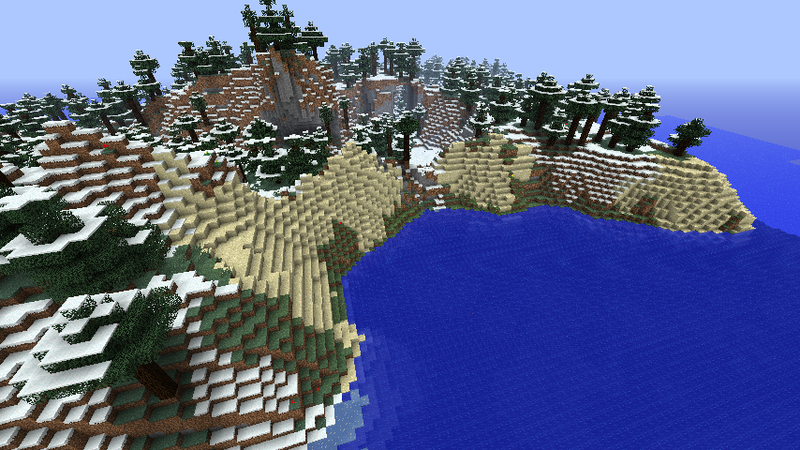 Here is a picture of the most popular seed before the terrain was ruined. Glacier was its name. Now, this isn't the best picture of the Glacier Mountains, but I will attempt to describe it. Imagine a seasonal forest with mountains sprawling across the whole biome. This may seem like the equivalent of today's ForestHills sub-biome but it is not! An area such as the Glacier Mountains was not something you would see every five minutes. 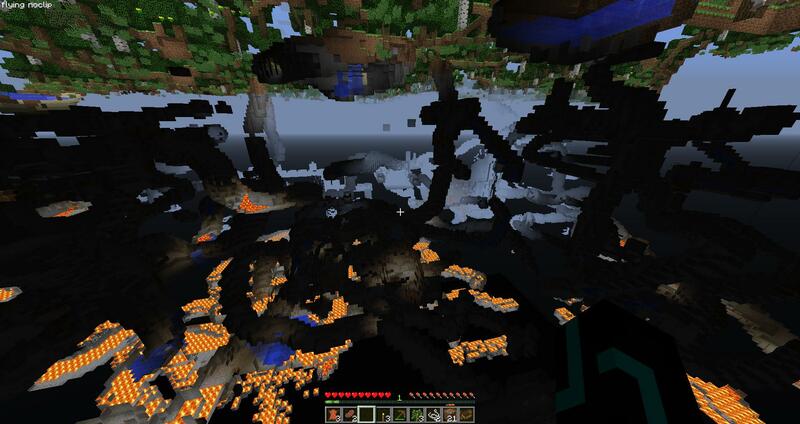 It was found by seed-hunting -- another damaged factor due to the 1.8 terrain changes. Ladies and gentlefish, this seed may just describe what height variation is all about. You see, if you exited the area of the mountains, there'd be terrain nothing like it. You would see occasional hills and land easy to build on! And guess what? This all happened within biomes of the same name. There were no limitations nor restrictions. Now before you start replying (and I urge you not until reading ALL of this post), let me show you what the 1.7.3 generator could do, even though people may think it wasn't possible. 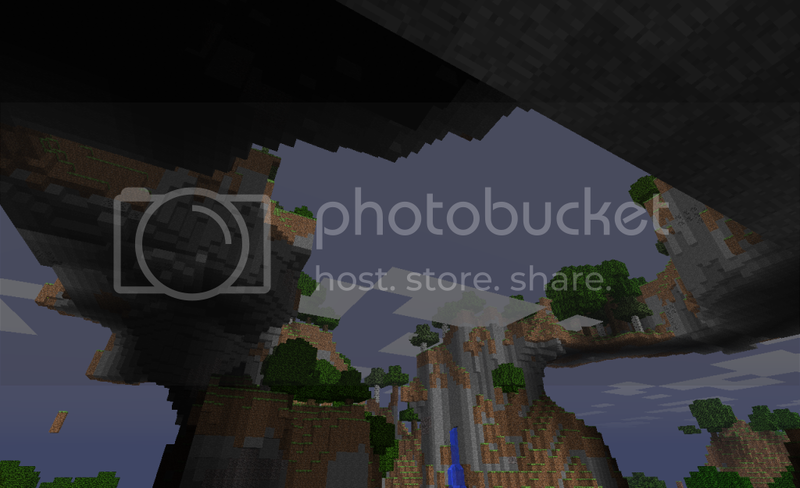 The picture above IS Beta-1.7.3 terrain, not Release-1.3.2. Yes, flat land was possible. REMEMBER, we are not asking for the previous generator! We want the current one improved so that everyone is happy!!!! Another flaw of the current generator is the underground generation. There are simply too many caves, and this problem is existent in every world, just like our height variation problem. Often, I find myself bored in-game, because within the first five minutes of a newly created world, I'm already set for life because I found a cave that extends on and on. Literally, we can now find stacks of iron ore and enough diamond to last us half a year within the first hour of gameplay! So why is this bad? It is understandable some people may like having extensive caves, as do I, but not all the time. Minecraft always needed more challenge, and this cave problem definitely worsens the issue. Back in pre-1.8, there were caves of varying sizes -- the same amount of variety that the mountains had. Now we are limited to seemingly endless tunnels and caverns. Don't you miss "conquering" a cave in less than 10 years? I know I do. This is absurd. The people who enjoy extensive caves are sure happy, but the people who want caves of varying sizes should be enraged! Another problem with current terrain generation includes the formation of beaches and the absence of gravel beaches. Gravel beaches were an undeniably cool feature to pre-1.8 generation, and Mojang had no reason to remove them when the Adventure Update hit our clients. Remember the "404 Challenge?" Well now it's impossible to have anything merely resemble it (except for the extensive cave system, of course). Sandy beaches are now always sloppily generated, therefore lowering the rate of variety within every world. ..Well that was awkward. The generator seems to just replace random coasts with sand blocks. Face it, pre-1.8 had things like this as well, maybe not as common, but definitely existent. However, pre-1.8 also had good looking beaches! This is what we call VARIETY -- when things stop reappearing over and over again. This is someone's example of a perfect beach. You've got to be kidding me. First off, two things need to be pointed about before getting into the specifics. 1. This is set on the Large Biomes option. Good terrain should be available to those who play on the default setting! 2. This "beach" is adjacent to a jungle biome. Beaches next to jungle biomes tend to look a bit nicer in comparison to those that are adjacent to other biomes. Therefore, this picture is a little biased itself. As said before, the main problem with today's beaches is that they are always going to have this form. Only one or two horizontal lines of sand are actually on sea-level. Again, we had crappy beaches and good beaches in 1.7.3 and this is good because of the variety it brought to the game. We all shouldn't be able to reach preffered terrain everywhere we go, right? That's the challenge and fun! Now that's what I call a good looking beach! Look how many consistent sand blocks are actually on sea-level. Compare that to the one or two lines of consistent sandy-coasts in current generation. Remember, pre-1.8 also had crappy beaches, which is a good thing because it distributed variety into every world. Keep in mind, this thread is NOT about the existence of oceans, the "RPG" features, the existence of the new world generation features, biome size, random placement of biomes, and possibly more. We also do not endorse the return of past generators or a new world option. If you want to discuss these said features, you are in the WRONG THREAD. Mods are a temporary fix to a long-term problem. Most of the terrain altering mods out there do not even live up to the standards that are put forth in this thread. They all are attempts to bring back 1.7 map generation into the current terrain. If you're asking Isn't this what we want? No, and this means that you did not read the full thread. So please go back, re-read the thread, and then re-post. Did not know that? Re-read the thread, and re-post. So for those of you who keep coming on here advertising different mods that we can use: 45 people have mentioned the same thing before you: so do not bother as it will not silence us. We feel the current map generation needs to be altered to satisfy all of Mojangs player base not just 25% (and yes those numbers are accurate .. the poll for this change is at 75% yes and 25% no) Did not know that? Simple.. Re-read the thread, and then re-post. Tell Mojang about this issue! You must include The Minecraft Team, otherwise they will not get it. Check out these related threads! - Please Fix the Terrain! When did it become boring? -Where Did the Mountains Go?! Seeds are completely pointless now - all they do is determine your spawn point. Might as well just use one seed and ask at the start if you want to start in the biome with trees, the biome with mountains or the other biomes with nothing in them. Has anyone tried tweeting jeb about this (I'm pretty sure Notch isn't working on Minecraft anymore)? To me, this is the single largest issue with Minecraft currently. Varied and crazy terrain was one of the greatest things about Minecraft pre-1.8. Now, Minecraft's terrain is more boring than in real life. Realism I could possibly stand (in a game with creepers and which originally became popular because of its crazy and interesting randomly generated terrain), but it simply isn't realistic to have no snow on any mountains, to have no trees (one tree per chunk doesn't count - I'm talking forests) anywhere where it snows, to have almost completely flat terrain everywhere except in one specific area which has huge mountains and nothing else. Some have said it's this way because of NPC villages - if that's the case, I'd much rather have no NPCs at all if it will bring back an interesting world. Please, can someone here who uses twitter contact jeb and link him to this thread or ask if he realises that Minecraft's terrain generation is horrible and boring now, and whether he intends to fix it? If Mojang think it's fine as it is and don't fix it, I honestly won't be playing anymore. Bring back variety and craziness or lose those of your customers who enjoyed (above ground) exploration, building in unique locations, searching for the best seed, admiring the views and even just doing other things in a world that didn't feel like a void. The problem I have with it is: EVERY. WORLD. LOOKS. EXACTLY. THE. SAME. Moving mountains to a single biome was simply the worst idea in all of gaming history. And even those look bland.I want the extremely random worlds that made Minecraft be awesome! Also the additon of ravines and rivers doesnt have anything to do with how the terrain and biomes are created. They are just superimposed over the landscape. This more realistic terrain generation is incredibly bland. Once you see one biome, you have basically seen them all. The old one was varied and the biome mixing created some nice landscapes. Also spawning on a beach made it feel like you washed up on the shores of a unknown land. I wouldn't mind some modifications to the underground how ever. The sizes are perfect, but they need more variety in each one. I was gonna post a hate comment, but once i looked at the screenshots i realised you were right! I haven't seen any awesome looking mountain formations since 1.0.0! All i've been seeing is the same old plains, swamps, and pine forests! I used to be ok with there being some caves, but now the entire damned underground is swiss-cheesed with them... Now I hate them. Perhaps the people who love the endless caves are playing the game in Peaceful or Creative mode. Caves are a whole different matter in Normal difficulty. They are constantly getting in the way of my mines and underground constructions. I would rather have fewer but more epic caves or actual caverns then an endless ant farm of caves everywhere I dig.. I kind of used to hate people who said the terrain was boring... but it is REALLY flat. I guess I have to agree now. While I'm in love with oceans and mushroomlands and jungles, there is not as much interesting stuff in the world. I really wish that jeb would put back in what notch took out: Mountain landforms. By that I mean not a mountain biome, but allowing allowing mountains to spawn in any biome on their own. That was one reason that the 1.7.3 generator was so friggin amazing. If Jeb made it so that mountains could spawn in the same sort of way as lakes, then things would get a lot better. 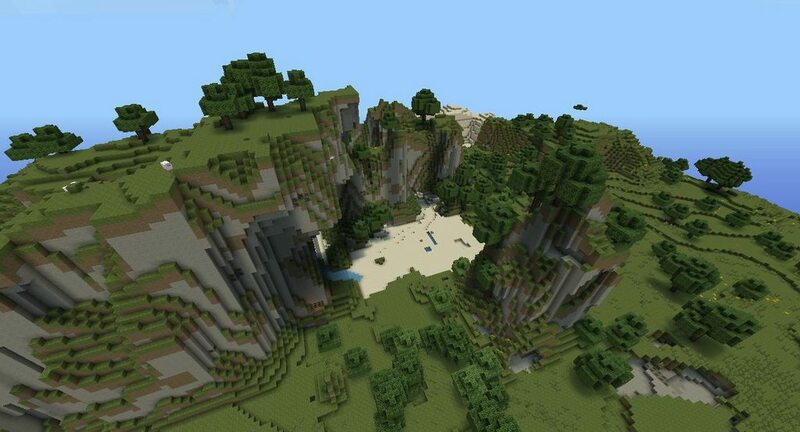 Then, mountains would be spawning in forests, giving us back that good-ole' tree filled mountain range we all love. It could spawn in Praries, to allow villages to be at the top of the world. It could spawn in deserts, to give us back those sand falls. They could spawn in oceans, so you could find just a random huge mountain in the ocean, kind of like a survival island. Heck, they could even spawn in swamps. Allowing for some pretty cool crap to happen. Also, Jeb needs to put back the gravel beaches. I loved the look of those, and they just made things look so good. I have been a heavy Minecraft player since Alpha 1.2.0_02 when I first started playing. It wasn't the mining or the monsters that urged me to play; it was the sense of adventure. Most of the time, when I make a new world, I don't plan on building, I spend most of the time exploring the unknown and seeing what Minecraft has to throw at me. When the ability to use seeds came out in Beta 1.3, it was then that my sense of exploration really started to rise. So many words and letters to type, so many worlds, but so little time. I loved it, each world had it's own uniqueness to it. If you managed to find a very nice world, you knew that this world was yours and no one else had one like it (unless you shared the seed). When 1.8 came out, it really hit me hard. There was little to no variety in the worlds anymore. Seeds (in my opinion) were then obsolete. What's the point of sharing seeds when every world looks the same. It is a fact that the terrain has less variety in it than before. I don't know why, but there are way way way too many caves. I don't recall there being this many before 1.8. I like exploring caves, and it's cool to navigate the enormous mineshafts. But only to a certain point. After spending hours and hours in a seemingly endless cave system, it just gets boring and repetitive. The cave system that I've been in since I started this world 3 days ago is just way too big. I dug a staircase mine type thing for a bit, just to collect a few ores to get me started. Within about 5-10 minutes I found my self in a cave system. 3 days later, I'm still in the cave system. I've seen about 3 ravines, destroyed 2 cave spider spawners, gotten lost in 2 different abandoned mineshafts and maybe 20 different caverns. I have half a chest full of coal, and the other half is iron, gold and a few diamonds.IT NEVER ENDS. I love enchanting, I love the new biomes, I love all of the new features, and there isn't one I would ever want removed from the game. I miss the old world though. The new world isn't the same, it doesn't even compare. I'm sorry to all those people I insulted back when the adventure update went live. I'm sorry because I know why you were upset. I wouldn't be against Mojang hiring a guy on full time to do nothing but work on the terrain, as long as it gets done. Also, is the Bukkit team actually still part of Mojang? I thought they were hired on and since then I've heard very little out of the progress they are supposed to be making. Here's a rundown of how I think they are splitting their efforts. I'm thinking Bukkit got there, wanted to finish working on the Mod API, opened up the core program and realize that it was just a bunch of empty classes that would require a ton more time than they figured. Then 1.4 was held back to compensate. Meanwhile, Jeb and Dinnerbone get to work on RPG stuff because Dinnerbone really only knows how to work with entities and Jeb is really only good at picking up the slack that Notch created when he would have his brain-farts so infrequently since the beginning of 1.8pre. And some people still think 1.8 and up is better than 1.7.3? The development process alone is horrible enough to be deal-breaker. Gah. I honestly can't stand the 1.3.2 terrain generation at all anymore. If I play singleplayer, it's always with my 1.7.3 .jar because it's just an eyesore to look at the current terrain generation. The terrain of 1.7.3 makes it seem like a whole new game. Honestly, I love jungles and swamps but I would trade it and NPC villages for the 1.7.3 terrain. That doesn't mean I want Jeb to just re-add 1.7.3 terrain and dump jungles and swamps, I just want him to improve it. What happened to the savannahs? It bugs me so much to see a desert next to a jungle. I don't even know why they removed the temperature system. I miss the beaches and the gravel beaches that were everywhere. Beach houses were possible back then. If you wanted a proper beach house now, you'd have to have a tiny 2x2 house just to fit it in the beach. It also annoys me a lot when people tell me to use Large Biomes if I want better beaches. Why should I have to use Large Biomes to enjoy a feature that was once perfect? We don't need the 1.7.3 terrain generator back, we need the current one improved. I'm not one to care about terrain, but I will admit it has become boring. 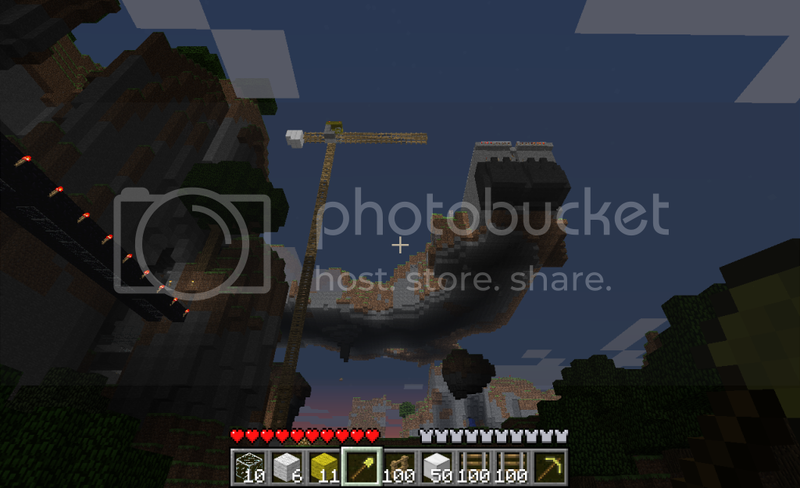 Yes, they took out some of the awesome biomes from before 1.8 which is very disappointing. Also, don't forget to mention the overabundance of clay, iron, gold, and also the annoyingly common abandoned mineshafts. In general however, the new underground terrain is more interesting than that of before Beta 1.8 but the surface terrain generation is much more boring now. 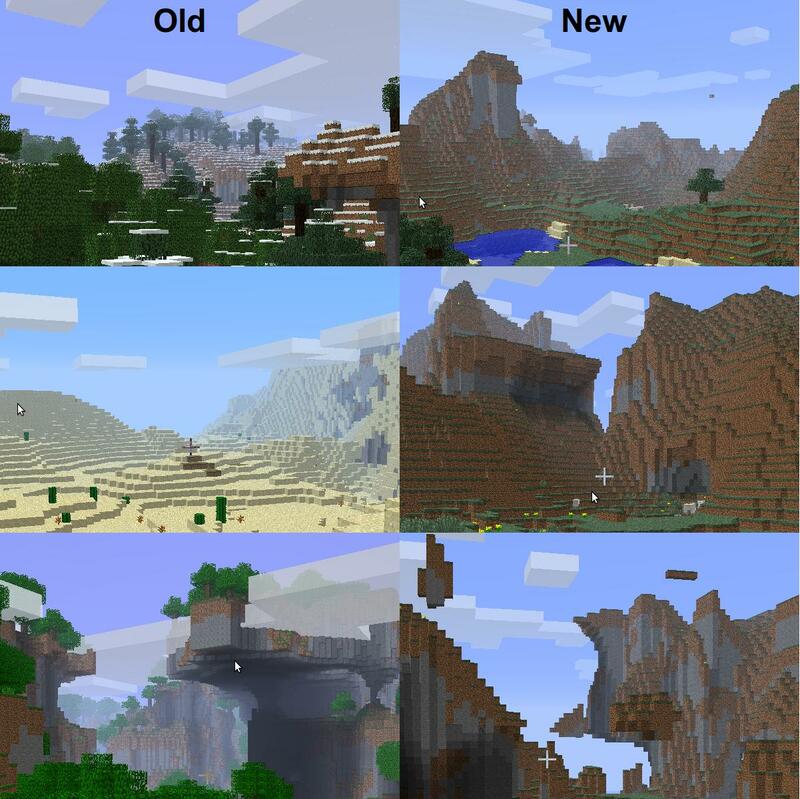 1) Integrate the old biomes into the new generation code and remove mountain biomes. The old biomes would be slightly adjusted so that they would be expansive like the new biomes are now. 2) Make the world more hilly and add occasional mountain ranges that don't warrant their own biome. These would be really tall long strips of mountainous region that would be difficult to cross. These mountain ranges could generate in any biome except for plains and oceans. They would be snowcapped if they reached a certain height unless they were desert mountains, or if they were in snowy biomes they would obviously be covered in snow entirely. 3) Touch up the terrain with more subtle features such as beaches, and add some randomness so that we would have more unique landmarks as we did in Beta 1.7.3 and earlier. 4) Tweak the underground terrain to have a much smaller concentration of abandoned mineshafts, and make iron ore less common. ---a ) Add new features unique to each biome to give them unique sets of pros and cons as to living in them. Perhaps deserts could have fertile regions along rivers and oases could generate around ponds where trees could spawn (palm trees perhaps?) and swamp biomes would have new dangerous mobs in the water for more balance. ---b ) Add new atmospheric effects individual to each biome to make them more distinguishable and to add aesthetic appeal like waves crashing in ocean biomes, heat distortion in deserts, crickets chirping and frogs croaking in swamps, and music playing and people chattering in gibberish in villages. 6) Add new biomes such as volcanic wastelands, and marshes into the generation each with their new set of challenges and features. 7) Raise the height limit for more interesting and difficult-to-scale/cross mountains as well as making more room for humbling architecture. TL;DR: Jeb should add a lot more variety into the surface terrain generation. Also, he should add balance to the terrain generation by adding more reasons to live in harsh, stark biomes like deserts and adding dangers to fertile biomes like swamps, and by reducing mineshafts and iron ore found underground. Survival Islands Challenge: Four islands and a vast ocean... can YOU survive? I was really upset that the beaches are now gone. :\ The desert biome definitely does not make up for it, as I like a beach right next to grass & trees. I'm really happy that the snow biome is back, though. In every flat land biome I see 0-3 trees. Shame. The terrain is getting boring,but at least I can still get enough space to build a simple house. Users lack the mental capacity to have intelligent discussion, and mods lack the mental capacity to make intellegent decisions... I give up trying to share my intelligence with the world. In 1.7.3 I had to excavate terrain to be able to build anything. Now the terrain is nice and perfectly flat. And I can build anything, anywhere. Oh wait. I have no materials to build with!! Dang! In 1.7.3 I had to excavate terrain to be able to build anything on it. That was logical and realistic. And it was a major source of my building materials. Now I have to create a useless, ugly quarry to scrounge up enough stone to build anything useful. I hate how everything is so... smooth. Everything fits perfectly into a biome. There are no transitions that I can see. They're not even pretty trees like we had before 1.8. No. They are all "Evergreens," which are so hideous I can't stand to look at them. I seriously burnt down an entire Evergreen forest and replaced it with one of the three zebra trees I found after 20 minutes of roaming. We need a more interesting terrain generator. At the moment, I'm using WorldPainter to create my own custom worlds that don't look so bland. Also the game is fundamentally broken now with its abundance of materials. It's all about exploration and combat as of 1.8, not *cough* mining and *cough* crafting. If they'd made a new game called AdventureCombat I wouldn't mind but I bought the Alpha when it was distinctly MineCraft. What? 48%? ARE YOU KIDDING ME?! I AGREE WITH THIS!!!!! I want the 1.7.3 world generator! IMO, yea terrain has gotten boring, if you've seen 1 plains you've seen them all, same for all other biomes. Meh, the mountain biomes are great and all but mountains themselves are what separated one seed from another in some cases. There aren't really surprises anymore hence everything is so repetitive. I feel the same way. Every world I generate just looks the same now, there's nothing special to it, really. Mountains are cool, but I just wish they had trees back and the random chance that it would be snow-capped. Swamps are nice, I guess, though the transitions with other biomes ruin the look of my world for me. I'd rather take aesthetic appeal over realism. http://www.minecraftforum.net/topic/814832-bring-back-beaches/page__p__10552392__hl__bring back beaches__fromsearch__1#entry10552392 Right below the portion about beaches. It is kind of unnoticeable, though. The new terrain generation is killing the game for me. I mostly like building so I never find landscape that inspires me. 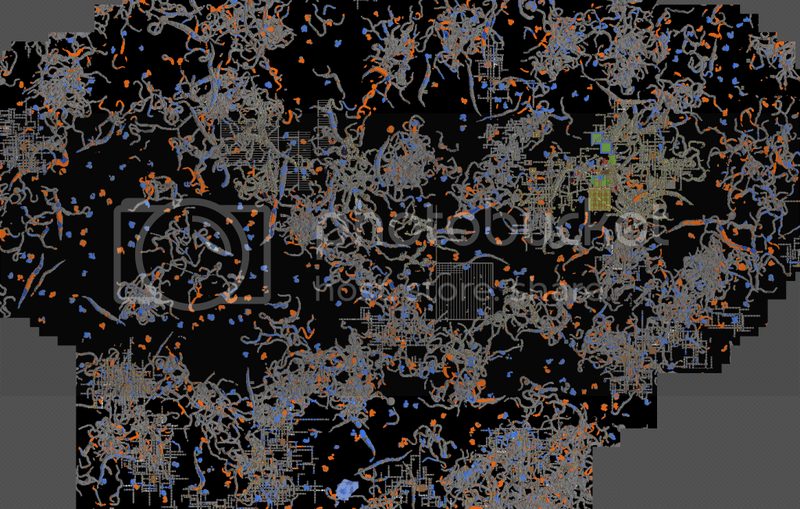 Yeah, every biome (except mountain one) is almost flat now, maybe with a few tiny little "bumps", but that's it. And as someone said before, every seed feels and looks the same. There is little to no variation and the terrain structure is constantly repeating (even the mountian biome). I don't know what they did there and why, but I really hope they're going to change it. I literally can't play Minecraft because of the dull world generator now. That's currently the biggest issue I have with Minecraft. This really needs brought to Mojang's attention. I do agree that the new terrain needs more topographic variation. Lets hope that the PhoenixTerrainMod comes back to life for 1.0. The old BiomeTerrainMod/PhoenixTerrainMod made the pre-1.8 terrain awesome. -Whats the point of a random seed generator, and the option to choose your seed if there is no discernible difference between them?? Abandoned mine shafts need to be less frequent, and more dangerous. Ravines- I kinda like ravines, but they still need some final polishing. -the floating wood needs to be fixed when a ravine crosses a mineshaft. -the ludicrous mountains of 1.7 need to come back. -Don't get me started on swamps!!. -but still needs more content. -also the terrain generator needs to be refined, so it doesn't intersect caves/ravines. -The netherforts liven the place up. -add chests to blaze spawner rooms?? Also (this one's really f******g me off); why aren't ender-crystals available in creative? ?